Hello everyone, today's quite an exciting blog post because I'm going to be sharing two products from a brand that is very new to me. 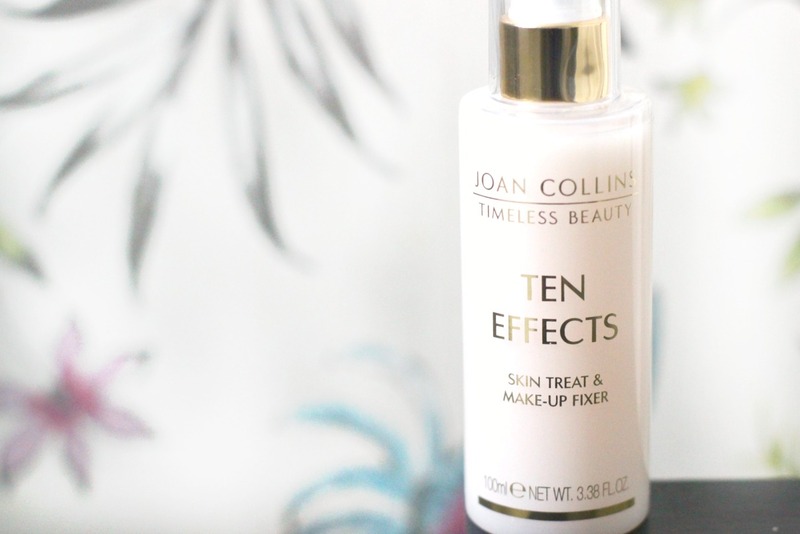 Joan Collins Timeless Beauty, is a brand owned by the Dame herself. She created it with the vision of it being an international luxury brand. Within the range it covers fragrance, makeup and skincare! Today I'll be reviewing a skincare/makeup item and a body care item too. When I received the email with the press release I was super excited to see that there was a makeup setting spray in this range, because if you're a long time reader of my blog you know that I love makeup sprays! 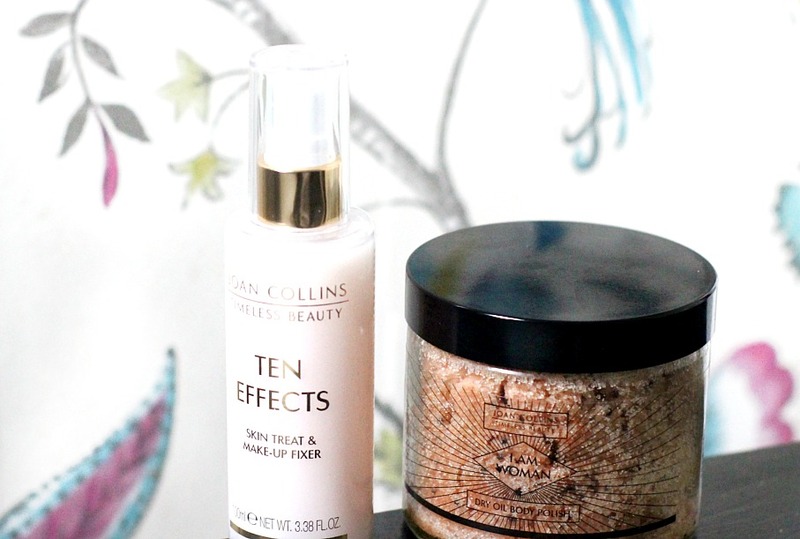 I've been testing out both the Ten effects skin treat and makeup fixer*(£18.00) and the I am woman dry oil body polish* (£16.00) for a few weeks now and I'm ready to share my thoughts. And aside from 'firms, refines wrinkles and minimises pores' I can vouch for the other claims! It's quite a strong spray, not really a mist but I don't mind that because I hold the bottle far enough from my face. I have been applying this before my makeup (or on no makeup days) and it instantly adds a glow to the face. I then spritz my beauty blender/mini primark sponges before blending in my concealer and finally I finish off my makeup by spraying this a couple of times. 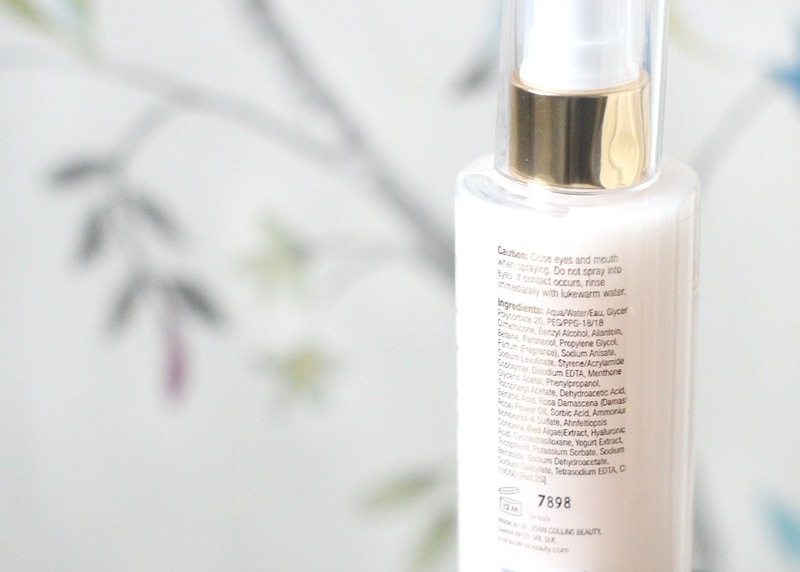 The result is a beautifully dewy, hydrated base which lasts a long time. I have been enjoying using this so much and the fact that it gives the skin such a glow makes it well worth the price tag for me! It's also packed with beneficial ingredients such as rose water AND 'glycerin', which is the key to keeping makeup in place. If you've tried the Nivea mens post shave balm, glycerin is also an ingredient which is high up on the list and again it's what keeps makeup in place. I'm really finding it difficult to not use this spray these days, which says a lot! 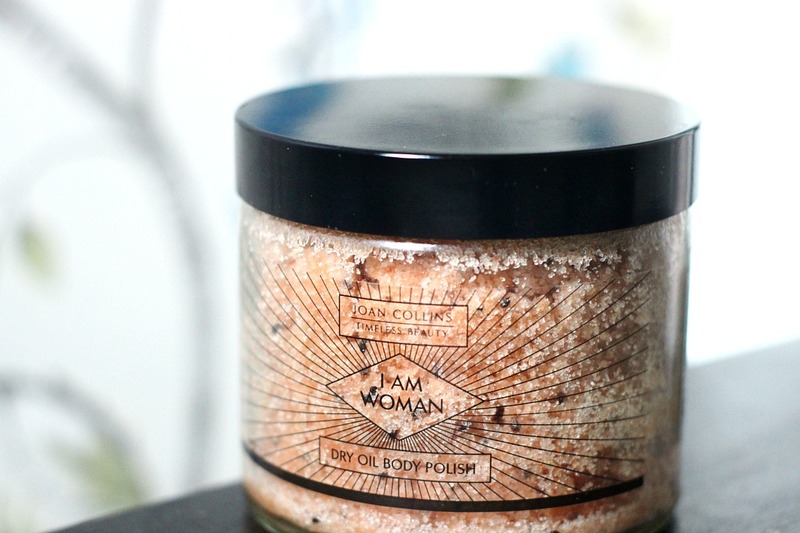 The second item I've been trying out is the I am woman dry oil body polish (£16.00), which I have been LOVING! The skin on my body is very sensitive so I'm always a little apprehensive to use new products in case my skin flares up. I didn't have anything to worry about with this however, which again comes down to the great ingredients in my eyes. It contains kiwi seeds and avocado oil, olive oil and jojoba oil so it is super kind to the skin, whilst also buffing away dead skin and leaving my arms and legs feeling silky smooth! The granules of salt aren't too big or rough, again making it fantastic for my sensitive skin and you get a HUGE 300g, so its great value for money too.